The Ruma Hotel & Residences Kuala Lumpur. 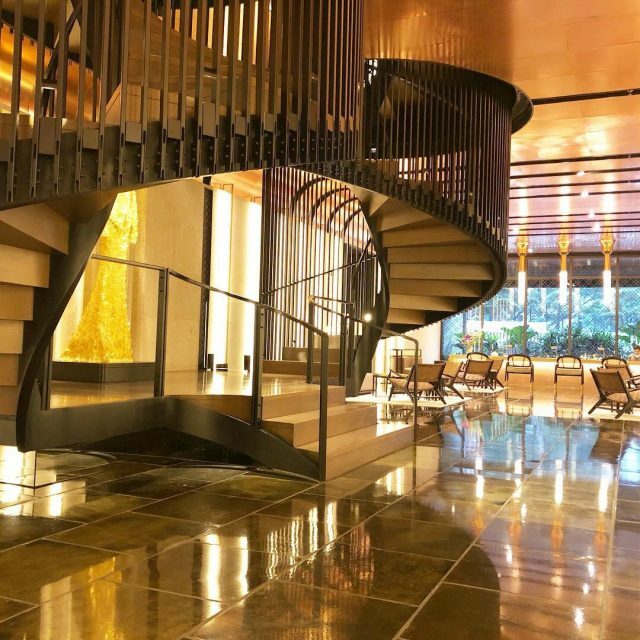 The Ruma Hotel and Residences is a new addition to the five-star hotel scene in Kuala Lumpur. 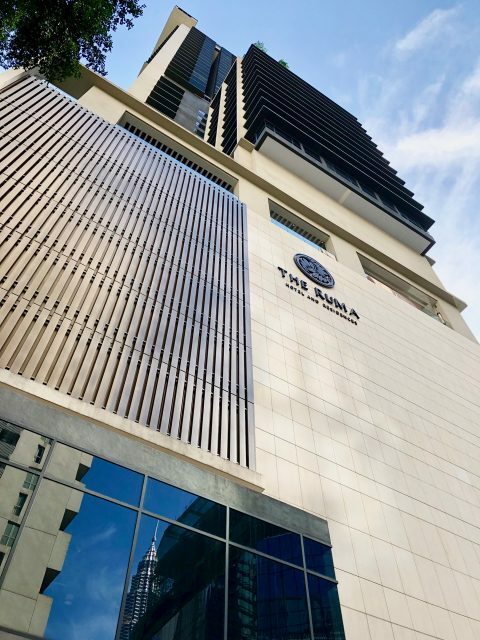 Located in the Kuala Lumpur City Centre (KLCC) district, a stone’s throw from the city’s iconic Petronas Twin Towers and the vibrant Bukit Bintang road, The Ruma enjoys a central location in the heart of the city’s business and shopping districts. 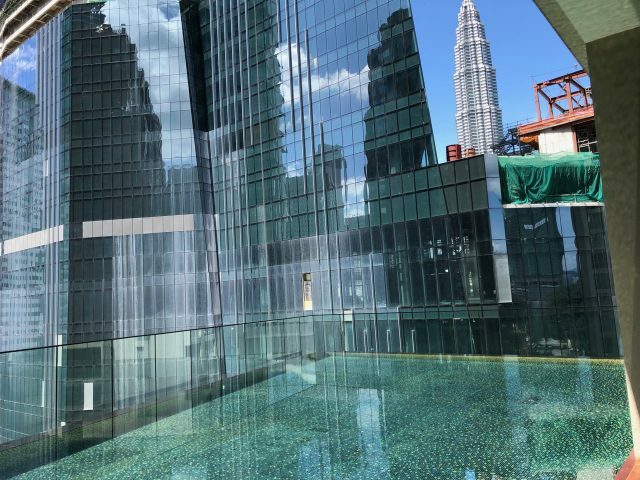 During my recent trip to Kuala Lumpur, I read about the opening of The Ruma Hotel and Residences, and together with my Mum, we decided to spend a night there – my Mum is an avid reviewer on Trip Advisor and we always have a great time checking out restaurants and hotels together, so we thought it would be fun to review The Ruma Hotel and Residences. We stepped out of the taxi to welcoming faces, big smiles and offers of help. First impressions are so important and this warm welcome by the bell-crew left a lasting impression. We were then led via a corridor into a gorgeous bird-cage like atrium before a large set of doors were opened to reveal a stunning lobby. 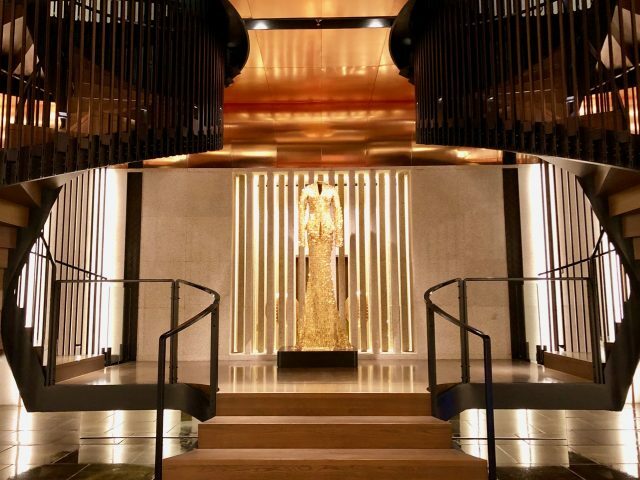 The first thing that caught my eye was the lobby’s centrepiece: a beautiful double-spiral staircase with a shimmering golden kebaya (a traditional Malaysian dress) in the middle. Upon closer inspection, I noticed that the kebaya was actually composed of hundreds of intricate, golden butterflies! You can see this more closely in my video below. The bird-cage like entrance to The Ruma Hotel. The double-spiral staircase and golden kebaya. 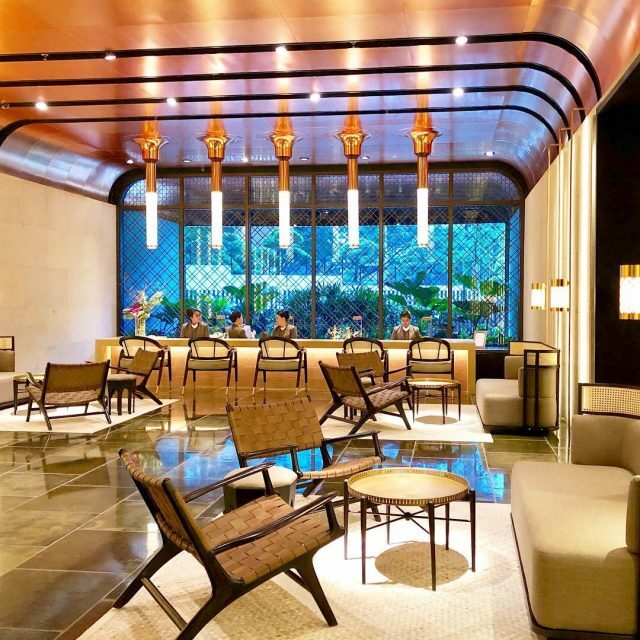 The lobby oozed a cool, new kind of Malaysian chic – traditional Malaysian elements blended with modern minimalist design. The ambiance was both luxurious and warm. I especially loved the copper ceiling and the century-tile flooring. 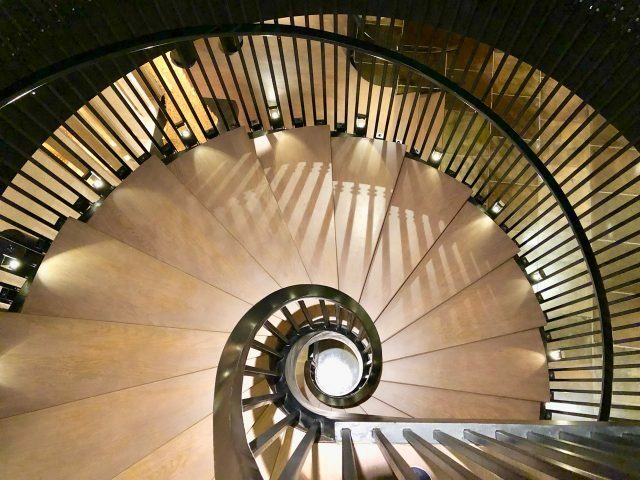 The symmetry of the space was unmistakable, with the reception at one end, a copy of the bar at the other end, and the double-spiral staircase in the centre of the lobby. The lobby with its copper ceiling and century-tile flooring. The staircase in the lobby. The check-in process began with a refreshing traditional Malaysian drink with a modern twist. Like the bell-crew, the reception staff were warm and welcoming. A great feature of The Ruma is its 24-hour check-in/check-out service, i.e. you can check-in and check-out any time you wish. I imagine this would be especially handy for travellers with a late-night flight – you can keep your room until you leave for the airport in the evening. Check-in was swift and we were led to our Deluxe Twin room on the eighth floor. The room was spacious, and like the lobby, the design was a blend of traditional Malaysian and contemporary influences. The view was of the neighbouring skyscrapers, with a side view of the Petronas Twin Towers – the KLCC district is packed with skyscrapers so it’s getting increasingly difficult to secure an uninterrupted view of the Twin Towers. Our room at The Ruma Hotel. The desk and city view. The bathroom was absolutely gorgeous, featuring beautiful stand-alone copper sinks and a separate bath/shower corner with a city view. The beautiful bathroom, with its copper sinks and bonsai tree. Another feature of The Ruma is the complimentary mini-bar in every room which is replenished daily. There was a selection of soft drinks, juices (floral/herbal/fruity), beer, mineral water and snacks. There were also coffee and tea making appliances. After checking out the room, we headed down to the lobby for a drink at the Seven bar & lounge. By this time, the staff knew our names. Kudos to the staff who were truly excellent – we were always greeted with a smile (and often by name), and they were always friendly, helpful, chatty but never intrusive. We had the choice of sitting at the bar/lounge or in the Librari (the adjacent library). The bartender was an expert cocktail maker and entertained us with stories and information about the hotel and the KLCC district. The Seven Bar & Lounge. I had a glass of wine and crisps at the Seven Bar. The Librari, or library lounge. That evening, we had dinner at the Atas Restaurant. The menu featured an intriguing mix of fusion/Malaysian dishes. We ordered two main courses, grilled king prawns and lamb, with a variety of side dishes. Again, service was friendly, prompt and with a smile. And the food was delicious! The lamb was particularly good: tender and packed with flavour. Atas Restaurant. I admired the symmetry in the hotel’s interior design. Fern leaf vegetables side dish. The next morning, we had breakfast at Atas Restaurant. 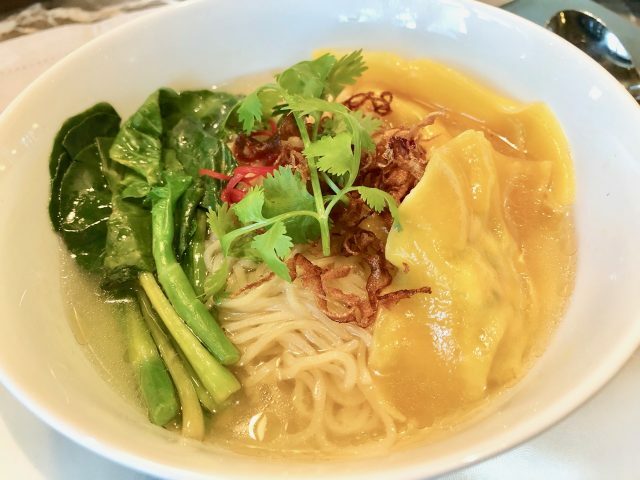 We could order a la carte so I went for the wonton noodle soup followed by pandan waffles with kaya. The waffles were superb! 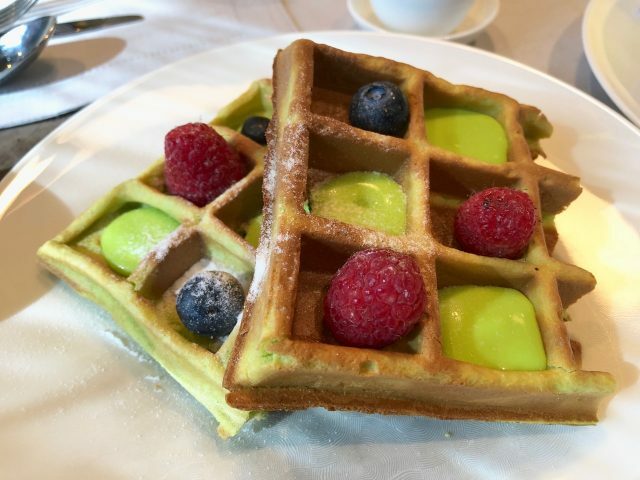 The delicious pandan waffles with kaya and berries. We also wandered up to the sixth floor. This floor houses an infinity pool and deck, a bar/lounge, a gym and the Spa (opening in 2019). It’s a beautiful, airy space and I especially loved the cocoon-like furniture. The gym is well-equipped but the pool is quite small. I loved those cocoon-like chairs. The sixth floor lounge and pool. The infinity pool, with a view of (one of) the Twin Towers. We spent the rest of the morning strolling around the KLCC district – the Twin Towers and Suria Mall are about a ten-minute walk away. There’s an underground tunnel that links the KLCC Convention Centre and Suria Mall, and an overhead (air-conditioned) pedestrian walkway from the Convention Centre to the Pavilion Mall for those who prefer to avoid the sun. We returned to the hotel in the late-afternoon for a cup of tea before checking out. Our one-night stay was short but we managed to get a very good impression of The Ruma Hotel. My Mum and I were in total agreement about the top-notch service, the stunning design and the terrific food at Atas Restaurant. 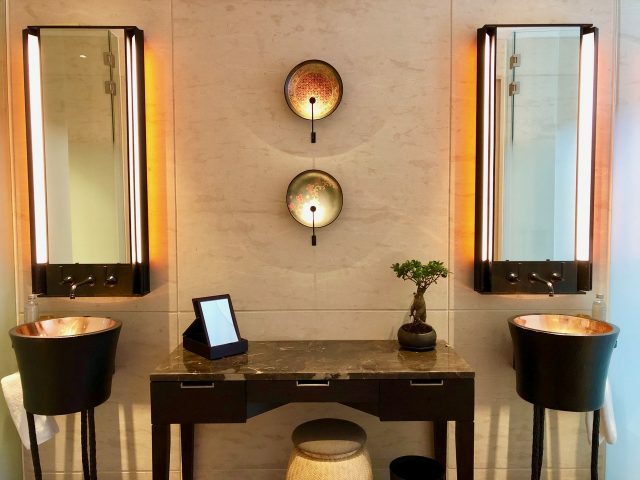 If you’re visiting Kuala Lumpur and you’re looking for a luxurious yet homely experience at a five-star hotel, check out The Ruma and Residences. Find rates for The Ruma Hotel and Residences (Booking.com). Note: my stay at The Ruma Hotel was at my own personal cost and, as always, all views expressed above are mine. For me though, KL will always be The Royale Chulan Kuala Lumpur. It just oozes 5 star quality.